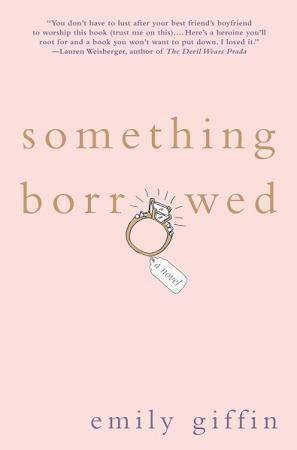 Something Borrowed by Emily Giffin! From goodreads: Rachel White is the consummate good girl. A hard-working attorney at a large Manhattan law firm and a diligent maid of honor to her charmed best friend Darcy, Rachel has always played by all the rules. Since grade school, she has watched Darcy shine, quietly accepting the sidekick role in their lopsided friendship. But that suddenly changes the night of her thirtieth birthday when Rachel finally confesses her feelings to Darcy's fiance, and is both horrified and thrilled to discover that he feels the same way. As the wedding date draws near, events spiral out of control, and Rachel knows she must make a choice between her heart and conscience. In so doing, she discovers that the lines between right and wrong can be blurry, endings aren't always neat, and sometimes you have to risk everything to be true to yourself. The past couple of months, Kelly and Lisa have been awesome and have led discussions for us, which is always much appreciated by me! If you would like to lead one of the discussions, email me or leave a comment and let me know which day would work best for you! I just need to have the discussion by the Wednesday before you sign up so I can have it ready to go by that Friday! Can't wait to see who is planning on joining us this month. Leave a comment and let me know if you are planning to join in!